Digital Arts Designs discuss everything marketing! From industry trends, to nasty Google changes, learn about it here. Grab a cup of coffee and take a moment to catch up. Have you updated your website within the last few years? Have you heard of Google’s “Mobile-Geddon”? If not, you could be at risk of becoming non-existent in the online world. The very reason websites exist in the first place is so that customers can find and engage with you. Sometimes it's the first touchpoint they'll experience with your brand. Other times it's to further qualify you before reaching out or making a buying decision. Think about what may happen to your business if you could no longer be found. What In the World is Mobile-Geddon!? Simply put, in effort to consistently enhance user experience, Google recently announced that as of April 21, 2015 they are penalizing websites that are not mobile-friendly. What could this mean for you? If you check your site on a mobile device can you answer yes to all of these questions? Is it an overall good user experience or a site that you would stay on if it wasn’t your own? Does it draw your eye to your calls to action? If you answered no to any of these questions, relax, we’ve got your back. A site is considered mobile-friendly if it has a "responsive design" which essentially adapts to smaller screen sizes such as mobile devices. 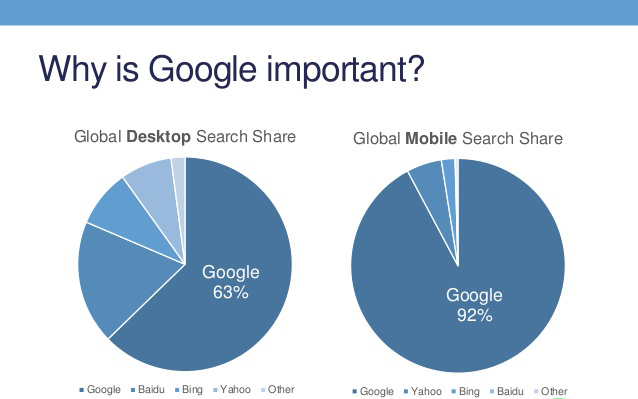 With this in mind, it's important to understand whether your website is mobile-friendly and complies. • Check your compatibility here. • If you have a site, you can also use your Webmaster Tools account to get a full list of mobile usability issues across your site using the Mobile Usability Report. If you got the “Awesome! This page is mobile-friendly” green light from Google, congratulations! Perhaps there is something else in the way of marketing that we can help you with (company brochures, social media, rebranding services). If so, please contact us today! If you got the dreaded red bar “Not mobile-friendly”, please read on!! Google ranks #1 with over 65% of the Search Engine market share (comScore estimated), compared to their rivals Bing and Yahoo. Bing and Yahoo are have gotten on board and are in process of making similar algorithm updates which are said to soon penalize non-mobile sites. Furthermore, now might be a good time to migrate your site to a Content Management System (CMS) if your website is not already utilizing this amazing technology. Similar to the simplicity of Microsoft Word, a CMS allows you or your staff to keep your website fresh and updated with new content such as industry or company updates, or portfolio or case study updates. Don’t Let Your Company Be Affected! Mobile is critical to your business and will continue to be so. Make sure visitors can have a good experience on your site when they’re visiting from their mobile devices! Digital Arts Designs has a strategic process that will help your organization stay relevant and stay found. Some recent examples of mobile-friendly websites that we've created for clients include Madsen Roofing and Waterproofing, MA Long Construction, and Lund Construction. We hope this information is helpful to get you on track to updating your website to enhance user experience. If not, we’re always here for you! Contact us today for a free consultation and discuss what your needs are in relation to updating your website to comply with Google’s recent updates, migrate to a CMS, or other marketing needs you may have.